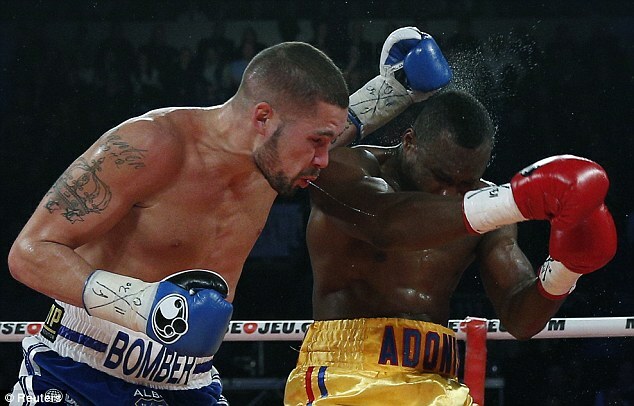 Tony Bellew's world title challenge ended in bitter disappointment as he was stopped by Adonis Stevenson in Quebec on Saturday night. The Liverpool light-heavyweight was out-boxed for large periods by the WBC champion before he was knocked down in the sixth round. Although he recovered to beat the count, Stevenson piled on the pressure to force the stoppage seconds later. TheHaiti-born Canadian then called out world super-middleweight champion Carl Froch as well as ring legend and IBF light-heavyweight champion Bernard Hopkins in his post-fight interview. 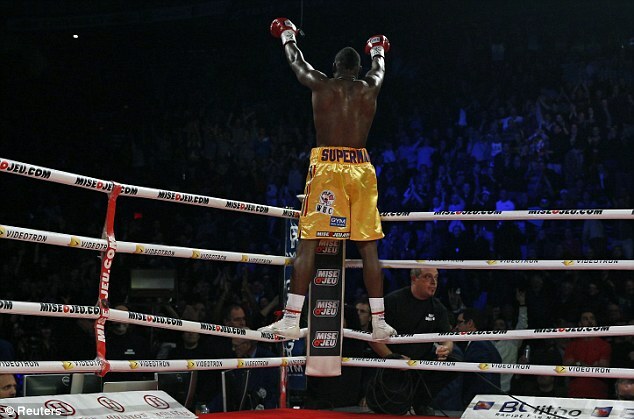 Stevenson, nicknamed 'Superman', has enjoyed a stunning year. Having avenged his only professional defeat to Darnell Boone, he ripped the world title from Chad Dawson with a brutal one-punch knockout victory. He followed that up with a systematic dismantling of Tavoris Cloud in September, stopping the former champion in the seventh round. Bellew, meanwhile, had lost his previous challenge for world honours when he was pipped on the scorecards by Nathan Cleverly in 2011. He had earned his shot at Stevenson by beating Isaac Chilemba at the second time of asking in a final eliminator in May. And, having celebrated his 31st birthday on Saturday, Belllew promised to bring the belt back to Liverpool but failed to reproduce the fireworks he had shown at Friday's weigh-in. The two men had gone head to head as the tension threatened to bubble over but in the ring, Bellew immediately went on the back foot. His plan had been to frustrate the champion before imposing himself in the second half of the fight. But Stevenson showed that he was prepared to be patient and pick his punches, stalking his opponent round the ring. 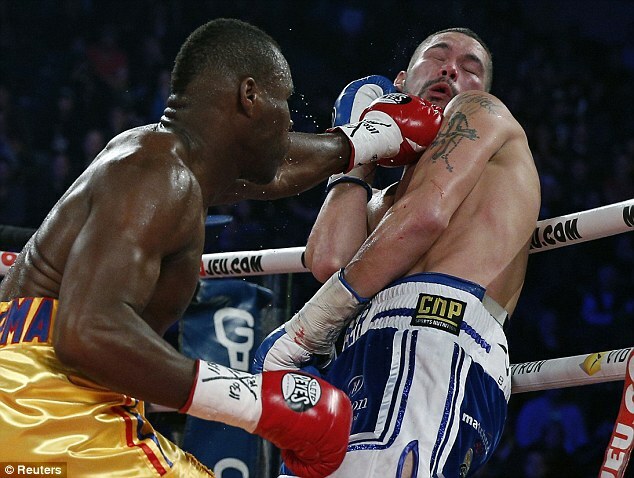 Bellew offered little in return and after a quiet opening two rounds, he was rocked by Stevenson's lethal left hand. The champion was on the canvas in the next round but the referee correctly ruled it a slip and Stevenson continued to march down his prey, landing left hands sporadically but ominously. 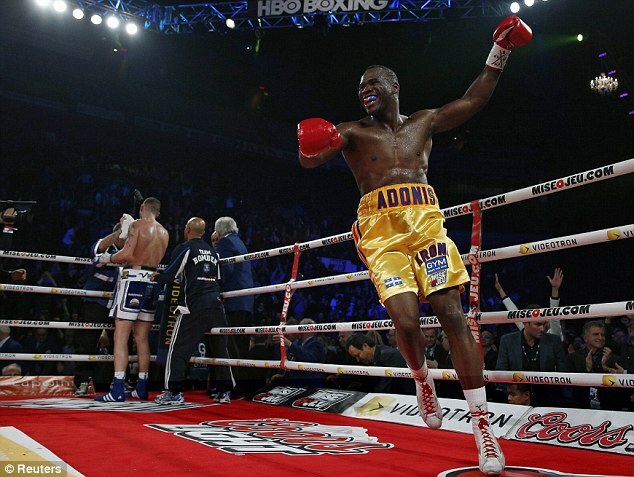 And with two minutes of the sixth round remaining, Stevenson pressed home his advantage. He sent Bellew to the canvas with his famed left hand and although the challenger beat the count, he was rescued from further punishment following another flurry of hard punches. 'I showed him Bellew,' said Stevenson. 'I knew he came here and was going to give everything. 'I cut the ring very well because he was moving a lot. I took my time and gave a good shot. 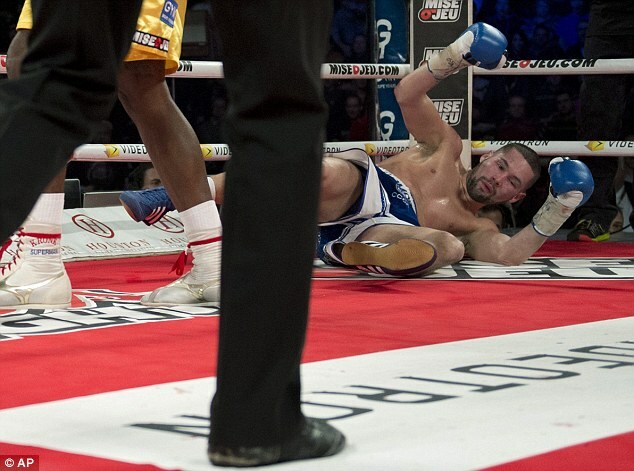 Bellew, meanwhile, admitted he was devastated at the result. 'I'd like to apologise to everyone for not doing what I said I would do!' he tweeted. 'I gave it everything and the better man won and that's it. Gutted. Another possible opponent for Stevenson is the WBO champion Sergey Kovalev who made a successful first defence of his title against Ismayl Sillakh on the undercard. Kovalev had won the belt with a brutal display of force against Cleverly in August, ending the Welshman's long reign as champion. And he showed he is here to stay by stopping Sillakh in the second round. The Ukrainian was dropped by a right hand and although he beat the count, he was knocked almost out of the ring by a right-left combination seconds later which brought an end to his challenge. 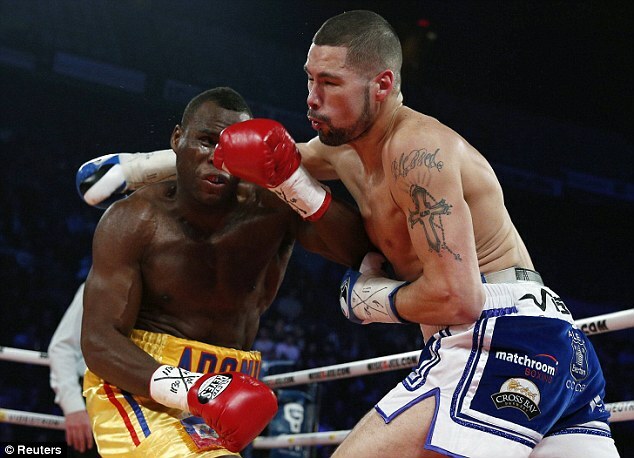 Tony Bellew has lost his bid to take the WBC light-heavyweight title from Canada's Adonis Stevenson in Quebec City. 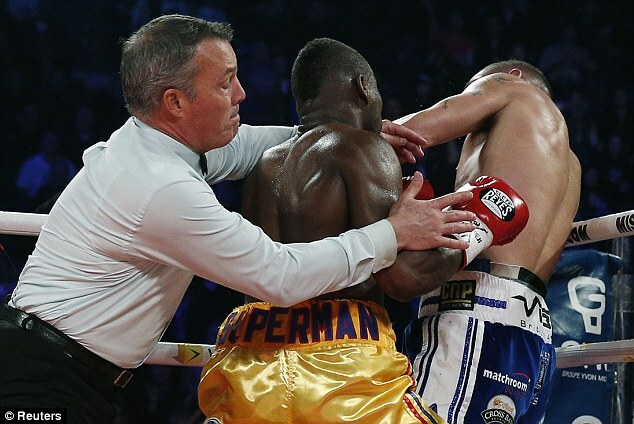 Stevenson won in a sixth-round technical knockout, the first time Bellew had been stopped in his 23-fight career. A huge left-hand knocked Bellew off his feet and, although he beat the count, the fight was stopped by referee Michael Griffin when the Liverpudlian was boxed into a corner and taking more punishment moments later. Bellew, who lost a world title challenge to Nathan Cleverly in 2011, had boxed smartly in the early rounds and drew blood from Stevenson's nose in the third. But Stevenson found his range with the left hand later in the third round, snapping Bellew's head back on a couple of occasions. A wild exchange in the fourth saw Stevenson go down, but it was ruled a slip after the fighters' feet tangled. Urged by his corner to vary his attack, Stevenson did just that in the sixth, setting up the knockdown with a right to the ribs. "He said I'm a dwarf, and the dwarf knocked him out," said 36-year-old Stevenson, who was giving up four inches in height and five years in age to the 6ft 3in Bellew. Stevenson improved his record to 23 wins - including 20 knockouts - with just the one defeat and he is now targeting a fight with England's Carl Froch or American veteran Bernard Hopkins, rather than a unification showdown with unbeaten Russian Sergey Kovalev. 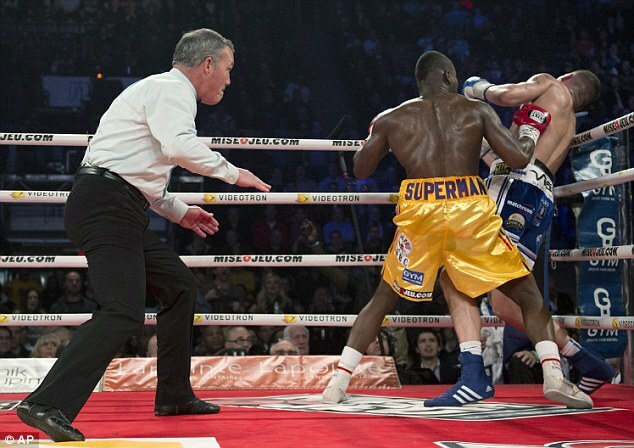 "The fans of Quebec City want Carl Froch or Bernard Hopkins," said Stevenson following his victory. "Kovalev is a good fighter too. 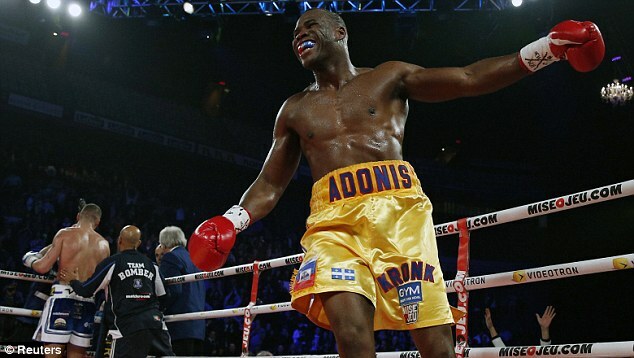 "I don't have a problem with Kovalev, right now but the fans of Quebec City want Carl Froch and Bernard Hopkins. That's what the fans want." 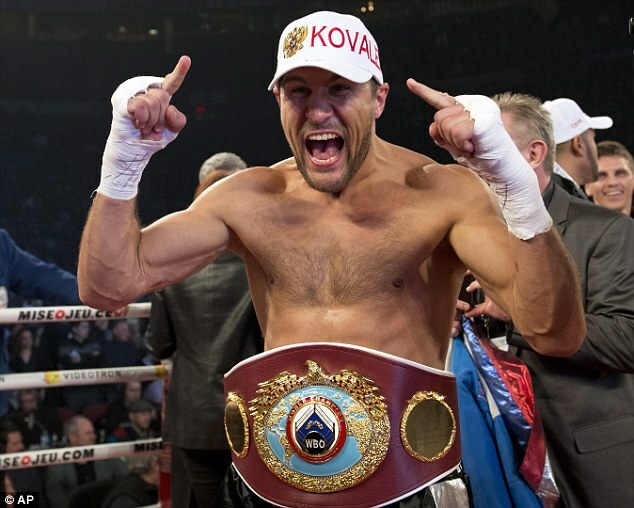 Kovalev defended his WBO version of the light-heavyweight title and stretched his record to 23-0 with a second-round knockout of Ukrainian Ismayl Sillakh on the same card.